For details on minor releases since FishEye 1.4, see the FishEye Changelog. The Atlassian FishEye team is delighted to present FishEye 1.4.FishEye 1.4 is a major release which focuses on integration, user management and performance. 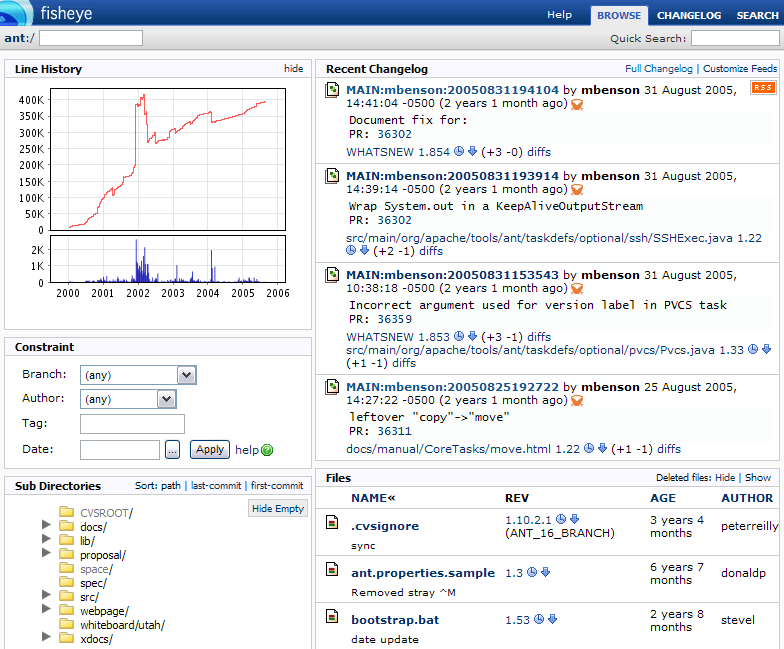 The updated FishEye Administration interface provides support for groups and improved user management screens. The new built-in integration with Atlassian Crowd extends your authentication and authorization capabilities. You can now include users and groups from one or more Crowd directories, and provide single sign-on (SSO) across Atlassian products plus any other applications that support SSO. The latest releases of FishEye and Crucible work together even more tightly than before, allowing you to see at a glance which files/changesets have been reviewed. You can also search within FishEye for files that have not yet been reviewed. Your [votes and issues|http://jira.atlassian.com/browse/FE] help us keep improving our products, and are much appreciated. Improved user interface makes user administration easier. Renaming of users is supported. Inbuilt integration with Atlassian Crowd for authentication and authorization. Users and groups in your Crowd directories now supported in FishEye. Single sign on (SSO) support via Crowd e.g. you can now sign in just once to access Atlassian JIRA, FishEye, Crucible, Confluence and Bamboo, and any other applications which support SSO. Links to existing Crucible reviews on the FishEye screens. So you can see which files/changesets have been reviewed. Search for Crucible data via EyeQL. For example, you can search for files that have not yet been reviewed. New 'FishEye' tab for JIRA issues and projects. Improved ability to create a Crucible review from the 'FishEye' tab within a JIRA issue. The 'FishEye' tab now shows review status (if applicable). Ability to connect your JIRA instance to multiple FishEye instances. Ability to configure the FishEye plugin via the AppLinks plugin. The FishEye plugin is now fully internationalizable.